This Economical device receives one SDI input and perfectly duplicates it. Then it re-transmits four SDI outputs for real time multi-viewing. 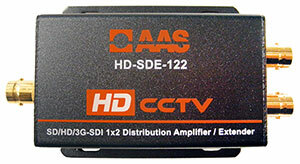 It is a reliable video device splitting a SDI or HD-SDI video source to four HD-SDI or SD-SDI display at the same time.